We left Tenedos on June 23, the ferry fares are paid both ways on the way back from the island. Not a bad idea at all. We drove through Çan (Chan), Biga (Big-ah), Karacabey (Karadja-bay), to Bursa with a lunch stop at Biga. Bursa is the original capital of the Ottoman Empire and served in that capacity before Edirne, and later Constantinople. It used to be a relatively small city famous for its silk and Turkish towels. Now, its population is pushing 2 million and it has become a hustle and bustle city with heavy traffic. Ergun had made reservations at one of the nicest and oldest hotels, Hotel Gonluferah. Located in the Çekirge district, overlooking the rest of the city. For those interested (at least in the winter) it has thermal baths inside. After a brief rest, we took a cab to one of the big attractions in Bursa, Ulu Cami (The Grand Mosque). It lived up to its name, both in size and in its appeal to many not only as a place of worship but also a social gathering place. Ergun told us that it had always served as a meeting place for people. I saw some men and women in prayer, some meditating, some chatting and socializing, one young boy was sitting down in a corner busy with what appeared to be his cell phone. Binnaz and Jan bought headscarves to appropriately cover their heads. and we all took off our shoes before entering the mosque. From there we walked to the nearby Koza Han, a very old structure built as a place for accommodations as well as for trade. Its architecture reflects early Ottoman sensibilities and displays beautiful masonry arches over the hallways. 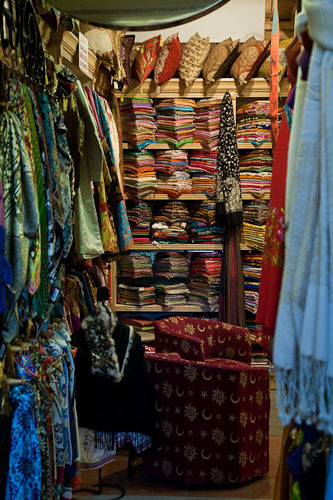 It is filled with shops of different sizes, focusing on textiles, mostly silk. After we strolled on the second floor, which is at the road level from the entrance, we walked down the stairs to go to the center courtyard. Under a large plane tree, we enjoyed some refreshments and walked down the hill to see the location where Ergun lived when he was a little boy. The house he lived in was no longer there, neither was the bakery where he used to help at the counter. Continuing our walk down the hill, we ended up at the old Jewish district and settled at one of the famous restaurants there. The food was OK, just, bet the cool drink felt good. After dinner, a cab took us back to Gonluferah. The next day, I drove us to Yalova and caught the ferry to Pendik. After that, it was an easy ride home. Below are some photographs I took along the way.